Categories: 0-10 V, Analog, Output, Type Of Transmitter, Transmitters, Input, RTD, Isolation, Unisolated, Measuring Channels, 1 Measuring channel, Design, Head Mounted. APAQ-3HPT is a multirange 3-wire temperature transmitter with Pt100 or Pt1000 input and 0-10 V output. Main applications are in the HVAC sector, where the control systems often require 0-10 V input signals. 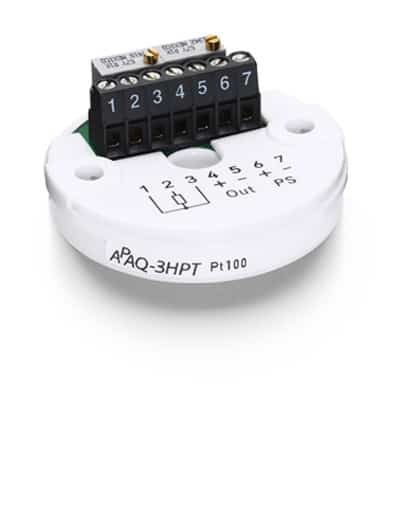 APAQ-3HPT is designed for high reliability and good industrial performance. The “low profile” housing is extremely durable and facilitates easy connections and adjustments.